View Poll Results: Would you be interested in attending? I'm in the area! Sign me up! I'm in the area but probably not. I'm not in the area but I'd probably make the trek. I'm not in the area, but go for it! I am thinking about putting together an event for summer 2019 that's like FocusFest/STFest but on a smaller scale and FiST-exclusive. This would likely be a one day event with a morning show and shine element and then afternoon autoX and evening drag races at a nearby raceway. There would be raffles, some trophies and other good stuff. It would be in the Seattle, WA area, probably August. Trying to judge interest on who would be seriously interested in making the trip to attend this. Thanks in advance! I might do it if it were at ocean shores, mainly because I have place to stay. 2017 Magnetic, Smoke Recaros, Red Calipers, Cravenspeed "Stubby Antenna", Ford ST Floor Mats, no-pistons Dead Pedal, Team Dynamics Pro Race 1.2 15x8 wheels, Continental Extreme Contact Sport 205/50/15 Tires, Gorilla Lug Nuts, XPEL Ultimate Front PPF, XPEL Prime HP Tint, Lamin-X Fog Light Covers, Auxbeam F-16 LED Fog Light Bulbs, AWR 88a RMM, Swift R-Spec Springs, Bilstein B8 Shocks, SPC Camber Bolts, Damond OCC w/ VTA, Octane Academy Badges, Ford ST Carbon Shift Knob, Mojo Short Shift, Mojo Shifter Extn, Dorman Symposer Delete, COBB AP V3, Rally Armor Mudflaps, NGK LTR7IX-11 6510 Spark Plugs, MTC Intercooler, Depo Hot Side Charge Pipe, CFM Valve Cover Breather, Pierce Lower Chassis Brace, Ramair Induction Hose, 2014-15 Evap Lines (D2BZ-9C047-E), Go Fast Bits DV+, Mountune Induction Upgrade Kit, Whoosh Crossover/Turbo Inlet Elbow, WWP 3" 409 Stainless Catback Exhaust, Powerflex Upper Engine and Transmission Mount Inserts w/ Bolt Upgrade, Whoosh Transmission Cable Bracket Bushings. I’d be interested, but it’s too far in advanced to commit. Not likely. Seattle area, because of proximity to Pacific Raceways, etc. not feel'in it due to lack of interest. oh man, i didn't even know this thread existed. I'd be down. Hah. This is what happens when you split off one specific sub-model of a brand. Back when Focaljet was a thing in the days of the Mk1 Focus, all the Focus model owners talked on the same forum. We did have some events at Pacific Raceways where a few folks would lap, other folks would do the go carts, then everyone connected for a pizza somewhere nearby. Maybe if you were to extend to the entire hatchback SVT/ST/RS community, you could pull something off like that. Informally attach to the July Mustangs NW Roundup track day. Just coordinate signups for the track day, figure out the karting schedule, and just show up. Don't worry about formal anything. The Mustangs NW guys manage their event, just collect in part of the paddock away from the Mustangs. 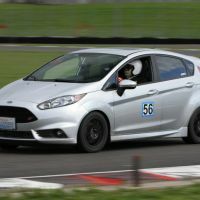 I have to admit that I'd probably bring my other hatchback to such an event to lap, but still, it could be fun. Id maybe show up ...but only if Koozy and Xanrules were gonna be there.....Been looking to take a road trip out west with the BAE ....some Family live out that way!